Spinach, Pear and Cashew Smoothie! 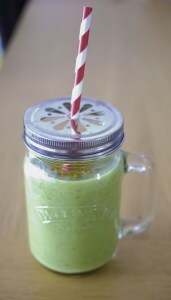 This smoothie is a great blend of spinach, bananas, pears, cashews and flax seeds! You can use any blender to make smoothies, but ones with a powerful motor will provide a smoother finish. I use a nutribullet. It is one of my favourite kitchen gadgets and I really get a lot of use out of it. They cost around £99 – quite pricey but you really get a great blender. It has a blending attachment as well as a milling attachment. I make nut milk, nut butters and nut flours in mine as well as smoothies! My smoothie recipe is super filling. This recipe makes one large glass of smoothie that I find keeps me full for most of the morning. Don’t worry about tasting the spinach. The flavours are masked by the other ingredients! I like to put a couple of cubes of ice in with mine, smoothies are best served chilled! Remember to sprinkle the bee pollen on after you have blended to enjoy the maximum nutritional benefits! I like to soak my cashews before blending. I normally soak a batch overnight. It makes for a really creamy smoothie! Wash your spinach and chop the fresh fruit. Add all ingredients apart from the bee pollen) to the blender and top up with the fresh water. Blend until smooth. 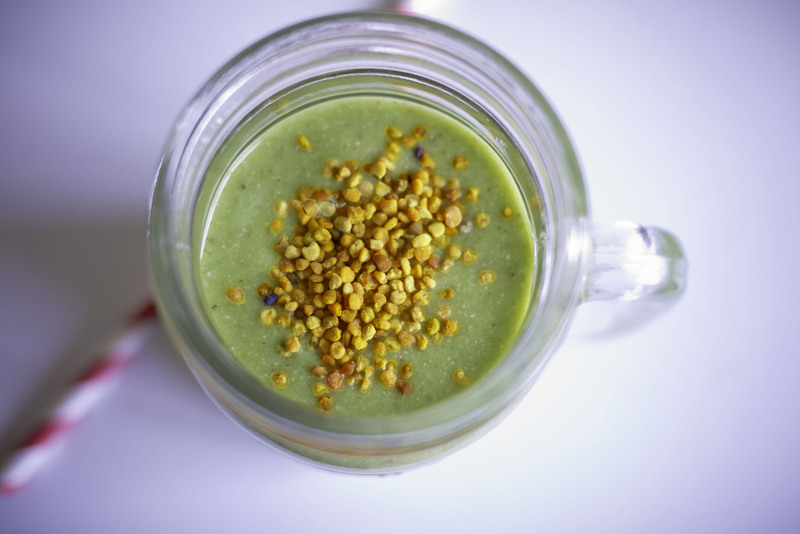 Pour into a glass and top with bee pollen!